Walter Doxey lived in Matlock. The bicycle has solid tyres, fixed wheel, acetylene lamp, pneumatic back tyre scraper?, drop handlebars, no mudguards and tool roll. A letter exists for a ride from Ashford-in-the-Water to Matlock in 40 minutes (18 mph average), probably on this bike. 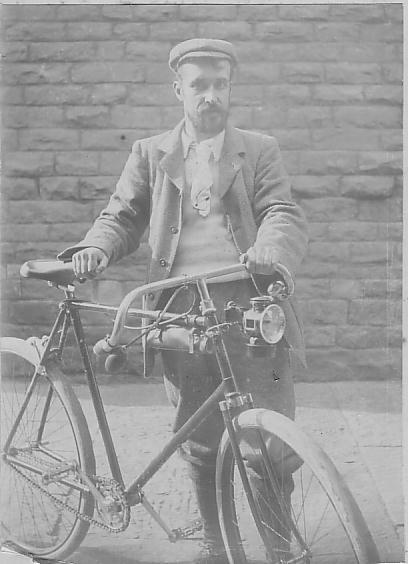 In 1995 the Cyclists Touring Club published letter and photo, and declared his use of the term "bike" was the earliest they had met. I arrived home all safe & sound on Monday last, my machine I am pleased to say behaved splendidly on the journey. I found on examining my machine on Monday before starting I found the nut that goes on the pin in the clip to seat stalk was split in four places. I took this to Vick & he said he would send for another at once. Will you be so kind as to call sometime when you pass & see if he has got this for me. He said he thought the other one would hold till I got home & strange to say it did so falling in two while I was cleaning my machine next day. I have fastened it together with the help of a little copper wire & fine solder & it might last a long time but of course it is a weak point. I enjoyed my holiday last weekend very much it always feels so much like coming home to come to your house & I always feel that I am both comfortable & welcome a feeling that I am sorry to say does not impress me in most places I go to visit. However I hope before the summer is over we may be able to get a good few runs in together. I had a run to Ashford in the Water last Thursday night the journey up being against the wind took just 1 hour of course this was in daylight & easy riding I rode all over the village had a look in the church yard etc & then lit up & started home at a pretty good pace. At exactly 9 oclock when I got over Haddon Bridge I found the handles had skidded about 8 inches out of true this I had to dismount & remedy but in spite of this & the fact that I had to keep turning up my lamp to keep it lit & straightening my handles as I rode I arrived home at exactly 20 minutes to ten - 9/40- the journey of 13 or 14 miles taking 40 minutes (what about solids). On Saturday I put two small pieces of pin steel in the handle clip & in my journey to Arbor Low in the afternoon over the roughest roads it has ever been my lot to ride they never gave once being as straight at the journeys end as at the start.